The Pelicans are re-tooled and have their sights set high for this upcoming season. Led by a dynamic combination of a high octane offense and a shut down defense, New Orleans looks poised to reign atop of the Southwest Division and bring home an NBA championship. Division rivals, the San Antonio Spurs and the Houston Rockets will try to stand in the Pelicans way. The New Orleans Pelicans schedule is jam-packed with big rivals and major competition, but it only builds up their hunger for victory this season! Get your New Orleans Pelicans tickets and head down to the Smoothie King Center to help lead your team to a championship victory. The New Orleans Pelicans finally made it to the playoffs for the first time since the 2014-2015 season. The Pelicans swept the Portland Trailblazers in the First Round. Then New Orleans met the infamous Golden State Warriors in the Conference Semifinals. The Pelicans could not compete with the super team and lost the series 4-1. Will the Pelicans bounce back this season and take it all? You will get the answer to that all-important question soon. The 2007-2008 Campaign- The New Orleans Pelicans, then known as the New Orleans Hornets, began the 2007-2008 season without being to the playoffs in the previous three campaigns. They had not even won any championship till that point but all that was about to change. The Pelicans won the division crown that year by going 56-26. The Pelicans were up against the Dallas Mavericks in first round of the playoffs and they came out on top, 4-1. The Pelicans then went head to head with the San Antonio Spurs in their first and only conference semifinals appearance till now. They put up a good fight but unfortunately lost out, 4-3. Nonetheless, it was still an unforgettable season for the franchise and its fans. Return To The Playoffs- The New Orleans Pelicans went into their last game of the season in the 2014-2015 campaign still in with a shot of making it to the postseason for the first time since 2010-2011 campaign. Their opponents that day were the San Antonio Spurs. The game was played on April 15, 2015 at the Smoothie King Center and the Pelicans delivered arguably their best performance of the season when it mattered the most. They won the game 108-103 and rubberstamped their appearance in the postseason. The New Orleans Pelicans do not have rivalries in truest sense of the word but there are a couple of teams that they want to beat more than any other side in the league. The Pelicans-Rockets Rivalry- The seeds were planted when Ryan Anderson and Eric Gordon made the move to Houston in 2016. The fact, these two sides play in the same division adds that little bit extra spice to the proceedings these days. There is a general feeling among many that the entire division is sitting on a powder keg and the situation between the Pelicans and Rockets can explode any time. Pelicans-Thunder Rivalry- Two names, Anthony Davis and Russell Westbrook. The games between the Pelicans and the Thunder have the potential of becoming one of the Western Conference’s future rivalries. That is mainly because of Davis (Pelicans) and Westbrook (Thunder). These are two of the most promising talents in the NBA today. Located in the middle of New Orleans' Central Business District, the Smoothie King Center is a great location for a night out. With one of the loudest fan bases, every Pelicans game leads to a great basketball experience. Situated adjacent to the French Quarter allows fans to enjoy the cultural richness of the city and an opportunity keep the party going before and after basketball game. Get your Pelicans tickets now before you head down to New Orleans for a night full of good food, loud fans and fun! The Smoothie King Center has been the home of the New Orleans Pelicans since 2002 when they were known as the New Orleans Hornets. They stepped out on the basketball court at their home for the first time on October 30, 2002 for a game against the Utah Jazz. The Smoothie King Center has also played host to other sporting events like the 2008, 2014 and the 2017 NBA All-Star Games. On top of that, it has also hosted WWE shows like Raw, SmackDown and the company’s pay-per view events. Music stars like Brad Paisley, Britney Spears, Taylor Swift, Lady Gaga, Aerosmith, Red Hot Chili Peppers, Van Halen, Garth Brooks, Eagles and Elton John among others have also stepped on to the stage at the Smoothie King Center to entertain their fans over the years. Chris Paul played for the Pelicans between 2005 and 2011. During that time, he was picked as an NBA All-Star four times and made it to the NBA All-Star first team once. He also won the NBA Rookie of the Year Award in 2006 as part of the Hornets/Pelicans franchise. Paul was also a two time assists leader and a three-time steals leader in New Orleans. Then there was Alonzo Mourning who was with the franchise between 1992 and 1995 during their days as the Charlotte Hornets. He became a two time All Star and won the Big East Player of the Year Award in 1992. During his three seasons with the Hornets he averaged 21 points and 10 rebounds. Larry Johnson played for the Hornets between 1991 and 1996. He became a two-time All-Star with the franchise and also won the NBA Rookie of the Year Award in 1992. Johnson also made it to the All-NBA Second Team in 1993 and to the NBA All-Rookie First Team in 1992. The 2018-2019 NBA schedule is out and the New Orleans Pelicans fans are excited about the prospect of seeing their favorite team take to the court once again. Regular tickets and the New Orleans Pelicans seasons tickets are both available. It is all set up to be a cracking campaign and the Pelicans will need all the support they can get from their fans in order to make a serious impact this time. Where can I buy Pelicans tickets? 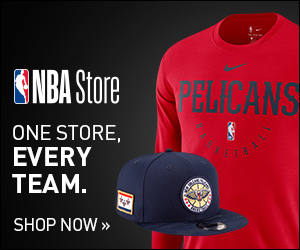 The easiest and quickest way to get Pelicans tickets is right here at ScoreBig! Our process for purchasing cheap New Orleans Pelicans tickets is simple and fast. There are so many online ticketing sites, that it can be hard for customers to find the right place to buy New Orleans Pelicans tickets at the cheapest price. At ScoreBig we think of our customers first and foremost. We offer daily deals for New Orleans Pelicans events, so our customers can get the best seats for the best prices. ScoreBig will always go above and beyond to offer the cheapest New Orleans Pelicans tickets on the market. The New Orleans Pelicans schedule above, displays all available events for 2019 and 2020. Once you find the event that you would like to go to, click the red “Get Tickets” button. It is located on the right-hand side of the event listing, it will take you to an New Orleans Pelicans event ticket page. ScoreBig's event ticket page will display all available New Orleans Pelicans tickets for that event. On the event ticket page to help with your search for the right New Orleans Pelicans tickets, use the filters at the top to select quantity, price range, and more. There is also an interactive seating chart so you can pick where you want to sit. When you are ready to buy a ticket, click on the listing, and you will be directed to ScoreBig's checkout page. Upon completion of the information fields, your order will be processed and your New Orleans Pelicans tickets will be delivered via email, mail, or to your mobile device. What makes ScoreBig’s site stand out from the rest? We are constantly analyzing our competitors to improve our site, service, and prices. ScoreBig.com employees strive to offer the best process and experience to buy cheap New Orleans Pelicans tickets. Our goal is to get you the best seats to New Orleans Pelicans events. We offer daily discounts on our site and for special promotions check out our newsletter. If there are no New Orleans Pelicans events currently available, you can use our search feature at the top of the page to see a list of all popular events going on near you. No matter your price point, we have all the best deals and discounts on New Orleans Pelicans tickets. For more information on prices of New Orleans Pelicans tickets and the schedule for New Orleans Pelicans, check out our listings above. The last thing you want to find out is when the New Orleans Pelicans event you wanted to go to is sold-out. Don’t worry in many cases ScoreBig has affordable tickets to sold out events. We sell tickets from GA all the way to premium seating and parking. Skip the scalpers in the parking lot and get your tickets online from top New Orleans Pelicans ticket brokers. We get you in all events, buy your New Orleans Pelicans tickets here from a brand that many trust and rely on for all their ticketing needs. ScoreBig offers a 100% money-back guarantee. If you have been in search of cheap tickets for New Orleans Pelicans, ScoreBig by far is the best option. That’s why ScoreBig has more loyal customers than any other ticketing site. Shop at ScoreBig for safe and secure New Orleans Pelicans event tickets.